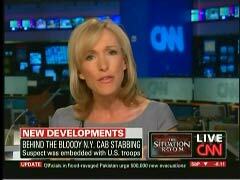 CNN's Deborah Feyerick joined the media guessing game as to the motivation behind the stabbing of Muslim taxicab driver in New York City, emphasizing the possibility it may have been "connected to this big Ground Zero controversy, where we're hearing so much anti-Muslim sentiment." Feyerick raised this hypothesis during reports on Thursday's Rick's List and The Situation Room. The correspondent's first report on the attack aired 12 minutes into the 4 pm Eastern hour of Rick's List. Anchor Rick Sanchez played a clip from victim Ahmed Sharif's press conference on Thursday before introducing Feyerick. She began by stating that when "Michael Enright, the suspect, was arrested, he had numerous journals and notebooks on him, all of them filled with writings, some of it completely illegible. That is now with authorities, all of that being vetted and looked through to see whether, in fact, there was anything indicating that he had undergone some sort of a mental or emotional change." FEYERICK: So, there are two very, very different pieces of the puzzle that investigators are now trying to figure out. Was this simply a crime that occurred because of some emotional stress, like PTSD, or is it connected to this big Ground Zero controversy, where we're hearing so much anti-Muslim sentiment? Was that the trigger? FEYERICK: The executive director of your group said- quote, 'The transformative experience an impressionable mind can have in five short weeks- there are intense emotions surrounding that.' Did anyone see a change in him? JOSEPH WARD, INTERSECTIONS INTERNATIONAL: Michael has been a responsible volunteer for our organization, and he was very consistent in that, in the whole year that we worked with him. FEYERICK (voice-over): Enright volunteered for a non-profit group promoting peace between different races and religions. He helped soldiers deal with the trauma of returning home. But what caused Enright to snap? The death of a soldier he met, maybe- or, perhaps, growing anti-Islamic sentiment fueled by controversy over the proposed Islamic center and mosque? Maybe it was something else entirely. Sharif says Enright asked if he was Muslim, seconds before allegedly shouting, "Salaam aleikum [Arabic for, 'Peace be upon you']- consider this a checkpoint,' then stabbing the defenseless cab driver. AHMED SHARIF: Of course, it was for my religion. FEYERICK: Prosecutors have charged the attack as a hate crime, but are investigating what caused Enright to allegedly snap. FEYERICK (live): Now, investigators are looking into a number of personal journals that Enright was carrying when he was arrested after this assault. They also say that inside his backpack was an empty bottle of Scotch. He was intoxicated when he was arrested. Now, as for Enright's attorney, we placed some calls to him- we are waiting to hear back. He does face a long sentence if convicted of this hate crime, and that's what this is being charged as. Suzanne? MALVEAUX: And Deborah, is- does anybody say that he snapped? Is he saying that, or his attorneys, or- where is that coming from? FEYERICK: It seems so out of character- what he did; why he did it; this, sort of, mounting need or desire. So it's unclear whether he saw something when he was- you know, in the theater of war, or- there's so much, sort of, anti-Islamic sentiment now because of this mosque- a lot of authorities are saying it's- people have to be very, very careful, because it's the kind of hate speech that could lead people to do things. So they're really monitoring very closely whether there is a rise in hate crimes, and this is considered a hate crime. Just over a month earlier, on July 21, Feyerick actually conducted a hardball interview of mosque developer Sharif el-Gamel, where she asked, "Why not have a prayer space for Buddhists or Jews or Christians...why must it be Muslim?" When el-Gamel initially replied, "There are Jewish community centers all over the country," the correspondent interrupted, "But the Jews didn't take down two towers." The developer continued that "there are YMCA's all over the country," but she gave a similar reply: "But the Christians didn't take down two towers."